You need to solve the puzzle in Den of Devils 1F to progress with your “Cancelling the Petrification Spell” quest. Here’s a game guide/walkthrough that will help you get through Den of Devils 1F. Warning: This page may contain possible spoilers of your game play. First, turn your map on so you can get a better view of this area. If it’s minimized on the upper area of your screen, press it. In times of despair, you Humans are easily consumed by jealousy and hatred. You will eventually be destroyed by the rage you can’t control. The above is actually the hint to this puzzle. 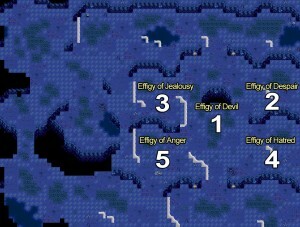 In Den of Devils we have 4 other effigies, from upper left to lower right of the map: effigy of jealousy, effigy of despair, effigy of anger, and effigy of hatred. The key to solving this puzzle is examining/touching the effigies in the correct order. And yes, your guess is correct! First examine the one at the upper right (effigy of despair), then upper left (effigy of jealousy), lower right (effigy of hatred), and lower left (effigy of anger). Be careful with the order because if you do it incorrectly you will get damaged. Upon solving the puzzle at Den of Devils the road to North will be unblocked. You can pass through it now and head to the passage that leads to the 2nd floor. Just examine the effigies in the specified order. Now that you are in the 2nd floor of Den of Devils, walk straight ahead and examine the Ancient book. The hint for this floor’s puzzle is “4 Key Keepers”. Okay, I’m not really sure if I should call it a “puzzle” because this one’s relatively simple. Goal is to get all four keys. On this map, we have four Crystal Orbs. From upper left to lower right: Crimson Crystal Orb, Green Crystal Orb, Purple Crystal Orb, and Silver Crystal Orb. Simply examine each of the four Crystal Orbs when you are ready for a “mob” of monsters. No particular order is necessary. After clearing groups of monsters from each Crystal Orb, a Key Keeper will appear. Defeat all four Key Keepers to obtain 4 keys. Once the four keys are obtained, use it on the Ancient Seal Stone on the North. The next floor is only a passage. The exit leads to a room where you will encounter a boss fight. The boss can heal himself. That’s what made the fight relatively hard.